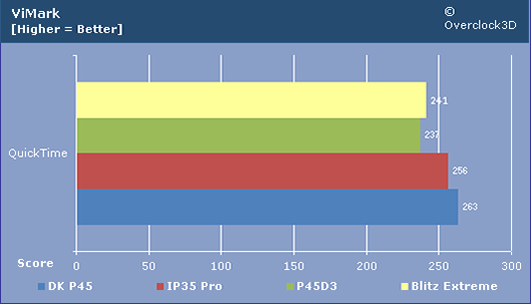 ViMark is the latest addition to the OC3D motherboard testing process and a relatively new benchmarking application in general. Designed to take the inaccuracies and guesswork out of measuring the time taken to encode video files, ViMark produces easily comparable and consistent results for encoding raw video into Windows Media, Quicktime, AVI and Gif formats. As always, a total of 5 benchmark runs were performed with the highest and lowest scores removed and an average calculated from the remaining 3 scores. 7-Zip is an open source Winzip-style file compression utility that has the ability to compress and decompress many file formats including its own .7z compression scheme. 7-Zip also comes complete with its own benchmarking utility for gauging the compression and decompression speed of the system that it is installed on. 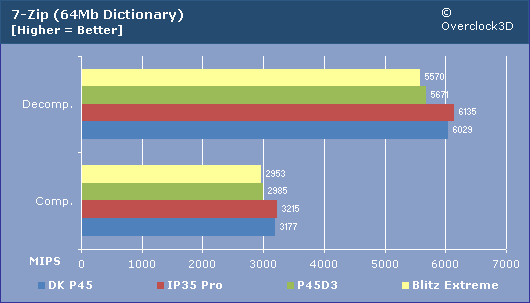 When it came to the encoding benchmarks, the performance of the boards were pretty much neck and neck. 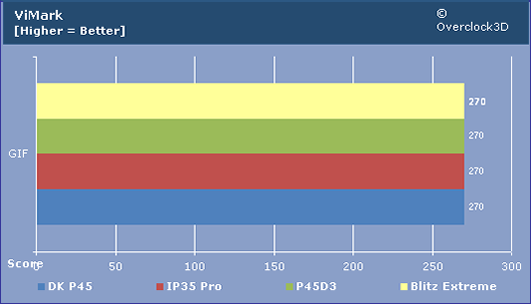 The deviation from this trend came during the Quicktime encoding tests, where the DK P45 actually came out on top. 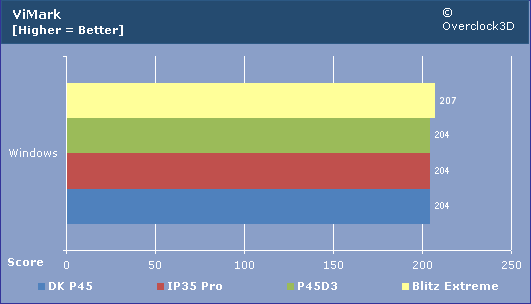 A similar trend to the CPU and memory benchmarks emerges in the compression & decompression tests, with the DK being a bit slower than the IP35.